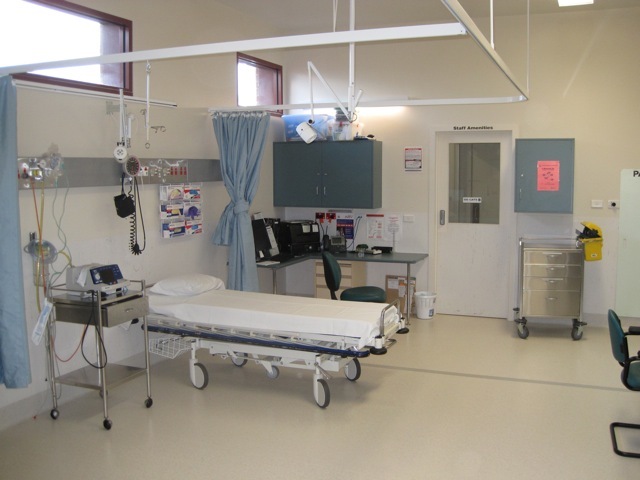 Although Rural Emergency Departments operate 24 hours a day, not all hospital resources can do the same. In order to maximize the number of daytime radiographers, a reduced service is often in place after hours. Deciding to call in a radiographer at night may reduce the number of radiographers available the next day. Unfortunately there is little research to base out of hours radiology guidelines on. Nobody really knows which images can be safely delayed until morning. The best that can be done is to see what has worked in other rural hospitals. These guidelines were originally written for Portland District Hospital in Western Victoria. Portland is a town of 10,000 people on the South West Victorian coast, four hours drive from the capital city and over one hour drive to the nearest regional centre. The hospital has 69 beds, and the Emergency Department sees 9000 patients annually. The radiology facilities available between nine AM and five PM on weekdays include X-rays, CT scans and ultrasound. The radiographer is on call from home after these hours and on public holidays. There is no onsite radiologist, but opinions are obtainable by telemedicine 24 hours each day. 3. Requests in accordance with this protocol can be ordered without radiologist approval. Borderline cases or cases outside the parameters of this guide have to be cleared by a radiologist. This is the option chosen by Portland District Hospital. These are officially out of hours, but sometimes it is inappropriate for patients seen on Friday night to wait for two days for their imaging. This is particularly problematic on long weekends. For this reason, consider a system where a number of patients may be brought back on a weekend afternoon who do not strictly meet the after hours parameters. An example of this would be a deformed wrist fracture: Imaging can wait until morning, but should not wait for two days. Portland is designated as an Urgent Care Service in Victoria’s Trauma system. It is tasked with rapidly assessing and stabilizing trauma patients and then moving them quickly to definitive care. Delayed diagnosis of traumatic injury, especially head injury or occult bleeding increases the likelihood of an adverse outcome. – Significant patient discomfort due to hard collar when delay in imaging is likely to be many hours. It can be difficult to diagnose the underlying cause for a patient’s respiratory distress. As treatments can be quite different (diuretics, anticoagulants, bronchodilators), it is important to make the diagnosis as soon as possible. Certain diagnoses (such as pneumothorax or large pleural effusion) can be treated immediately if they can be confirmed. Unless the diagnosis under consideration is likely to require immediate surgery, imaging can be delayed. It is often sensible to discuss the case with surgical staff prior to imaging. Most patients with limb fractures can be made comfortable with splinting and analgesia. They can return the next day for x-ray. Even moderately displaced fractures are unlikely to be operated on after hours. They should also be splinted, but the patient may need to remain in the emergency department until x-ray is available the next morning. In general, patients being transferred to intensive care should not have their imaging delayed. If a patient requires urgent transfer for surgery, but that cannot be arranged until imaging results are known, imaging may have to be performed out of hours. This entry was posted in Hot topics and tagged Emergency Department, Guidelines, Improving emergency care, Radiology access, Rural by crem. Bookmark the permalink.